We have inquiries daily for a ZWave smoke detector for Canada. A Canadian ZWave smoke detector will allow ZWave enabled home automation systems to create triggers, email or text alerts and scene activations in case of smoke or a fire. The problem is that until now there has not been a Canadian certified Zwave smoke detector available. USA smoke detectors are not certified for Canada. Why is this important? It’s important because it’s illegal to install or use a 120V device that isn’t certified for Canada. Also your insurance company or possibly the fire marshal will have issue with use of a detector that is not certified. Unfortunately it’s very expensive to have a Canadian specific model certified. We finally have a great solution! 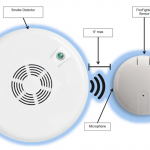 The Ecolink ZWave Firefighter works with your existing smoke detector(s). It’s actually an audio detector that installs right beside one of your smoke detectors, and listens for the “temporal pattern” made when the alarm goes off, and then it sends a signal to your ZWave automation system. The beauty of this design is that you keep your existing hard wired 120V smoke and CO detectors that are certified for Canada. They will continue to do their jobs as your life safety device. In most cases your home’s smoke detectors are interconnected, meaning when one sounds, they will all sound. In that case you really only need to have a single Firefighter module at one detector. If you prefer redundancy you can place Firefighters at each smoke detector. The Firefighter can also be used with a Carbon Monoxide or CO detector, so you can have alerts based on dangerous CO levels. With one or more of these modules installed and working with a compatible automation system you can get remote alerts in case of a fire or CO incident. You can also set up some great automation actions. For example, in case of a fire or smoke, turn on all the house lights and turn off the HVAC system fan so it doesn’t blow smoke throughout the house. You can notify friends, family or neighbours to alert them to the problem so they can confirm if there’s a real problem or false alarm.